Like Snyder, I lived in Washington Heights as a kid, then moved to New Jersey. My mother moved back when I went off to college, and I slept on her couch during grad school downtown. So I know at least a little about the neighborhood. 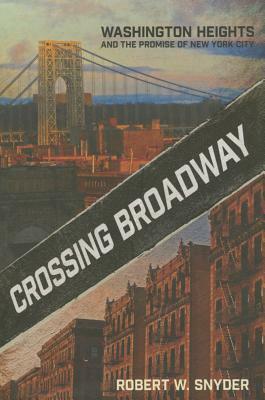 Crossing Broadway is a thorough review of the demographic and political currents there over the past 50 years, but I found the writing a little flat. The most lively chapter is about the turmoil at George Washington HS, which does indeed say a lot about the city as a whole. A comprehensive, highly readable political history of upper Manhattan (including Inwood as well as Washington Heights). Snyder, a professor of journalism, understandably focuses on reporters and newspapers as his central sources, but extensive interviews with both ordinary people and neighborhood leaders help complete the picture. There is ample attention here to structural matters like real estate, schooling, and the impact of racism and immigration on both, but also to the particularity of stories that do not simply exemplify Snyder's structural account. From an academic historian, one might ask a bit more theoretical heft; from a reporter, this is as good as it gets. Wonderful story and terrific analysis. Nice idea, very well researched, not much stuck with me 8 months later. A nice topic but an overwrought and overly personal book that needed a bit more editing. Review by Edward Shapiro for the Jewish Book Council. I've lived in Washington Heights for 35 years and never once referred to it as Quisqueya Heights, or heard others refer to it as Quisqueya Heights but It sounds interesting either way.